How to setup your Streamtime to allow for multiple currencies. 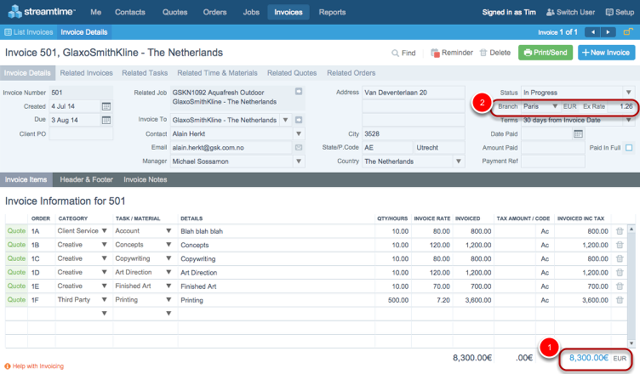 If you have clients or suppliers in other countries you will need to create multiple currencies and tax rates in Streamtime. To create a new currency in Streamtime go to Setup > System Setup > Currency & Tax and either check the box of the currency you wish to use from the ones listed (1) or click the New Currency button to create a new currency (2). 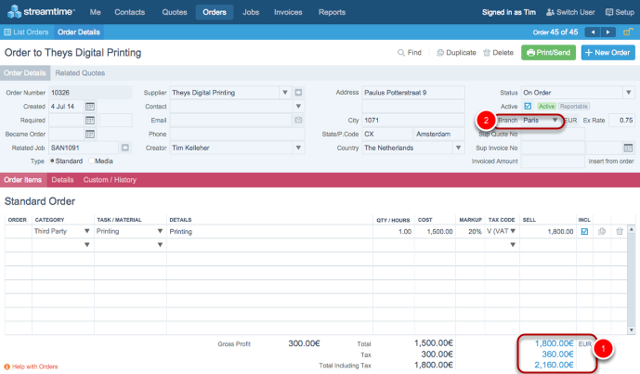 To create a new tax rate and code click the New Tax Code button (3) in the same screen. Note: It is best to check the accounts package that you will be integrating with to be sure the correct tax code is set. Different packages have different defaults. In order for your new currency and tax code to be integrated into Streamtime you need to setup a new branch for them. Do this by going to Setup > System Setup > Branches and clicking the New Branch button. You can now input all the relevant details for this Branch making sure you select a currency (1), include an exchange rate (2) and select a tax code (3). 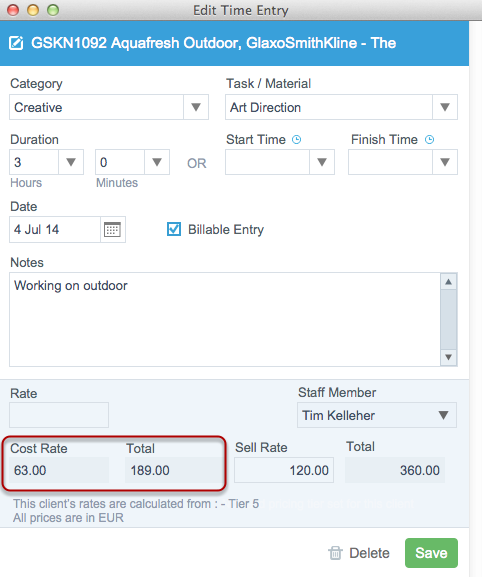 Now you'll want to create a new pricing tier so you can quote and invoice your clients in the new currency. 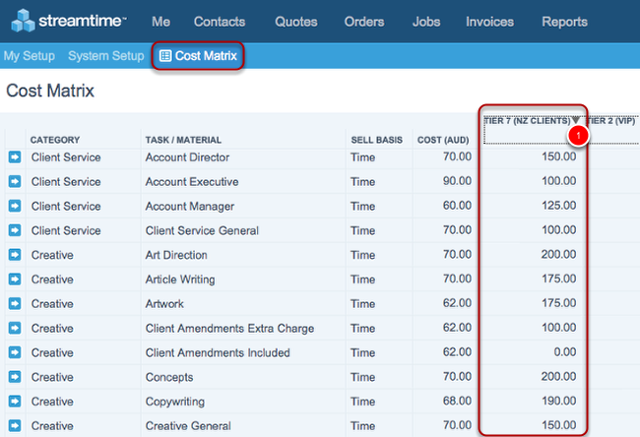 To do this go to Setup > Cost Matrix and click the info arrow next to one of the items in your cost matrix. Now click the New Pricing Tier button (1) to create a new tier then you can give your pricing tier a name and select which currency applies to the pricing tier. Note: you'll only be allowed to select from the currencies you've setup in step 1. You can then go back to the Cost Matrix list, select your pricing tier from the drop down menu (1) and populate the charge out rates in that currency for the pricing tier. 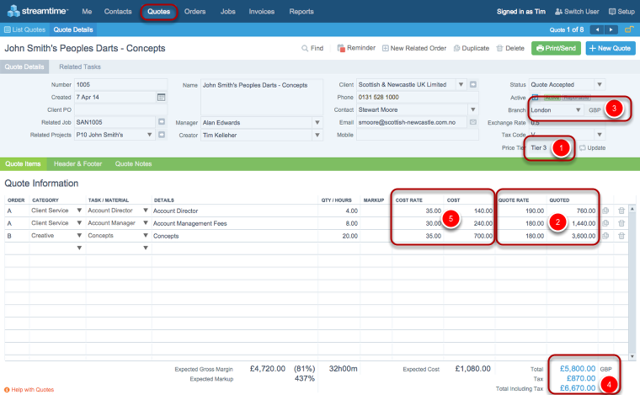 Now we've done all the setup we can assign the correct branch (1) and pricing tier (2) to our clients and suppliers in the Contacts tab. By assigning the branch to the contact, Streamtime knows which currency and tax code belongs to that client and by assigning the correct pricing tier you will now be able to charge the clients at the correct rate. When you create quotes for your clients, the Pricing Tier (1) assigned to the client determines the rates that the client will be charged (2). The branch assigned to the client (3) determines the currency and tax rate (4) applied to the quote. It also determines the exchange rate used to convert your original costs, which will be created in your home currency, to the currency applied to the quote. You can change the exchange rate on a quote by quote basis by going to the exchange rate field (1) and changing the rate then clicking the Update button (2). Note: This will only change the cost rates (3) on the quote not the quote rates as the quote rates are determined by your pricing tier. 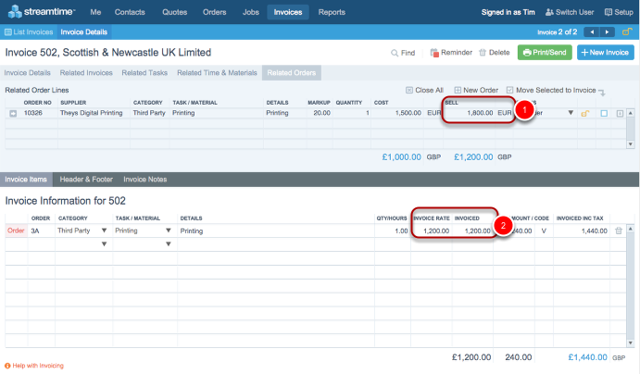 When you create an Order in Streamtime the currency on the order (1) will be determined by the branch applied to the supplier (2). 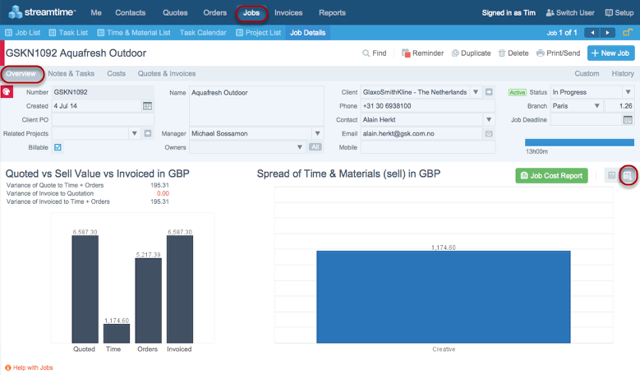 When you're checking costs on the job, the Order costs will be in the currency of the order (1) and also be displayed in the Home currency (2). 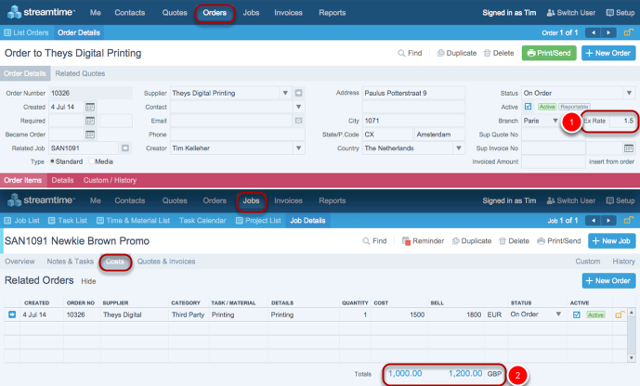 When transferring an order onto an invoice, if the order is in a different currency to the job (1), Streamtime will convert the order to the job's currency (2) using the exchange rate. If you adjust the exchange rate on an order (1), it will automatically adjust the home currency costs on the associated job, nothing will change on the order itself. 3. The cost rates of time and materials will be shown in the currency of the job . These are converted using the exchange rate - see step below. Cost rate applied to a staff member is created in the home currency in Setup > System Setup > Users, however when a staff member adds time to a job that is in a different currency, Streamtime uses the exchange rate on that job to convert the cost rates from the home currency into the job currency. When in the financial overview of a job, all figures are converted to the home currency. The same applies to the financial view in the Jobs List, all figures are converted to the home currency. 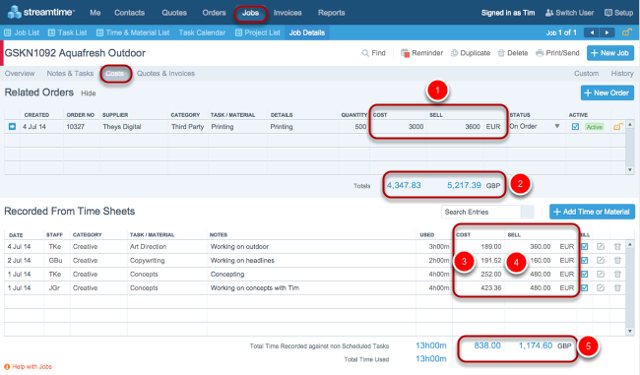 The invoice will always be shown in the same currency of the job (1) as determined by the branch (2) assigned to the job. Any currency conversions required, for example, when a related order might be in a different currency, will be converted using the exchange rate applied.